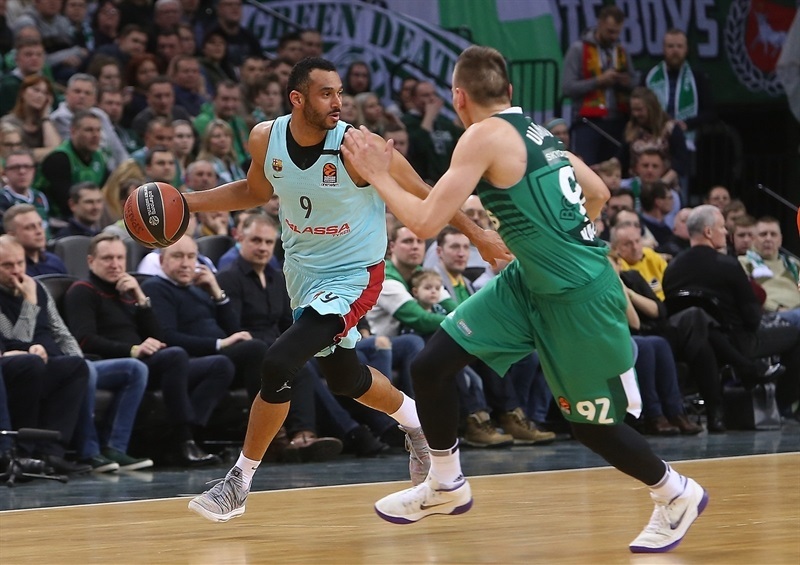 Zalgiris Kaunas got closer to clinching a historic playoffs spot by downing FC Barcelona Lassa 90-74 at Zalgirio Arena on Thursday. 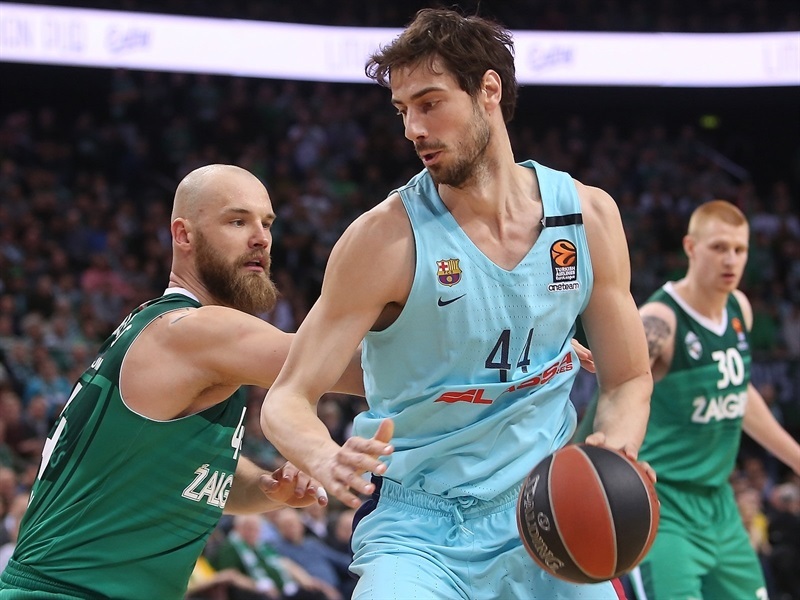 Zalgiris improved to 15-9 in the Turkish Airlines EuroLeague Regular Season standings while Barcelona dropped to 7-17. Axel Toupane led the winners with a career-high 21 points. Kevin Pangos added 18 while Aaron White had 11 for Zalgiris. 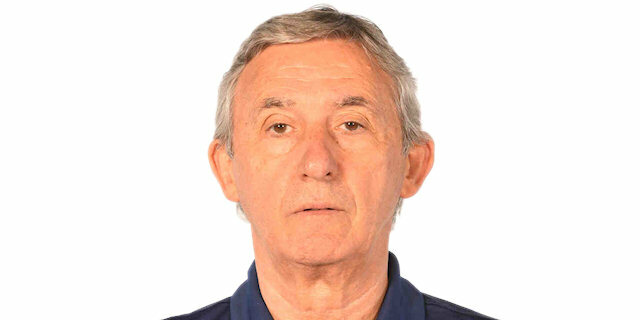 Pierre Oriola led Barcelona with 18 points. Ante Tomic added 11 while Petteri Koponen had 10 for the guests. Pangos and Antanas Kavaliauskas sparked an early 8-0 run and a triple by Arturas Milaknis gave Zalgiris a 19-15 lead after 10 minutes. Pangos stayed on fire, getting help from Brandon Davies to make it a double-digit game, 44-34, at halftime. Zalgiris rolled after the break, as White and Milaknis fueled a 10-0 run that broke the game open, 63-44. Free throws by Pangos soon made it a 20-point game, 70-50, after 30 minutes. 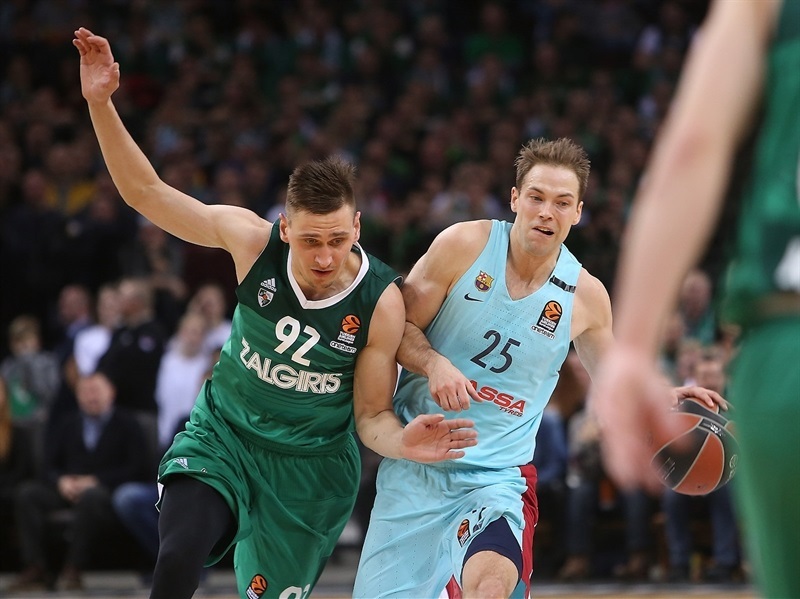 Nothing changed after that, as Zalgiris kept a safe margin all the way until the final buzzer. Toupane got Zalgiris going with consecutive driving layups but off-balance shots by Adam Hanga and Adrien Moerman tied it at 4-4. Oriola made free throws that Pangos did one better with a triple for a 7-6 Zalgiris lead. 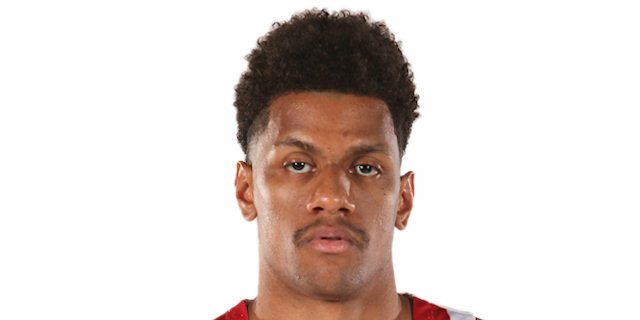 Hanga buried a corner three-pointer but a floater by Pangos ignited an 8-0 blast in which Kavaliauskas followed a layup with a jumper for a 15-9 score. 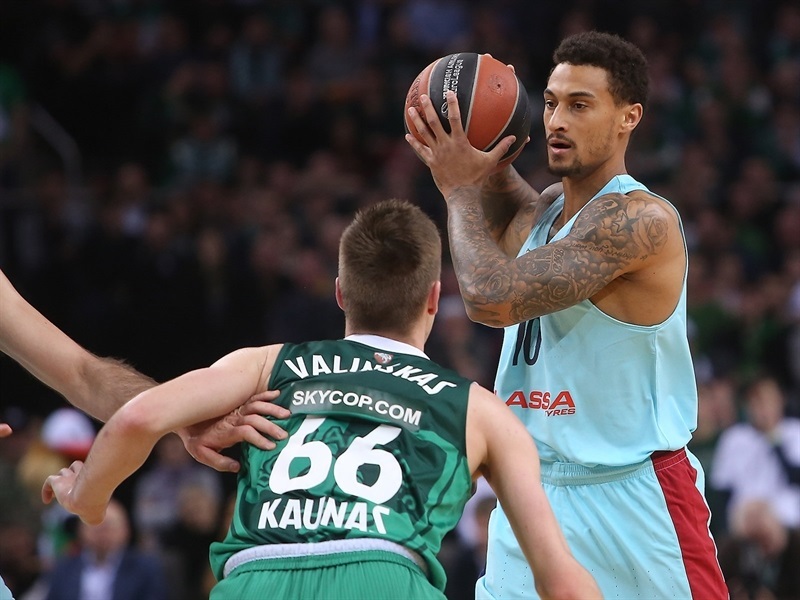 Koponen stepped up with a layup-plus-free throw and a triple for Barcelona, but Milaknis answered from downtown for a 19-15 Zalgiris lead after 10 minutes. 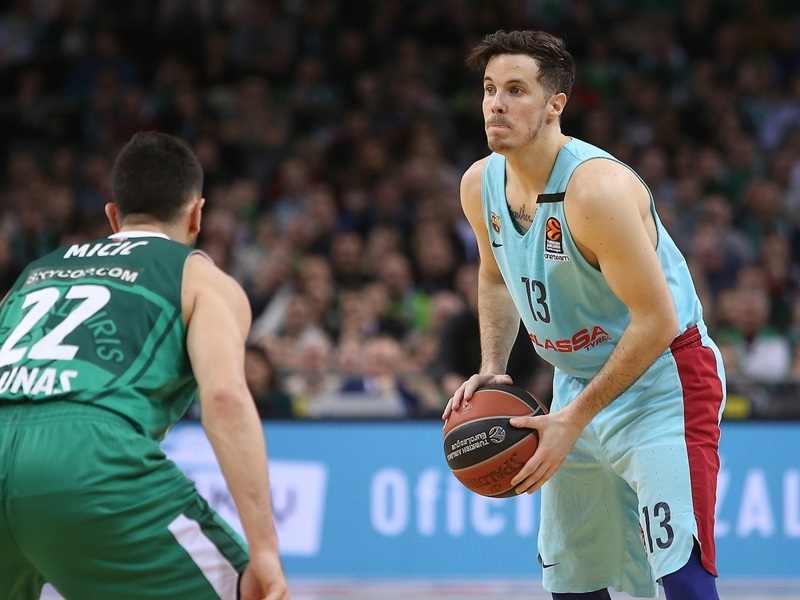 Victor Claver hit free throws and Tomic dunked, but a layup by Paulius Jankunas and three-pointers by Milaknis and Vasilije Micic boosted Zalgiris's lead to 27-19. 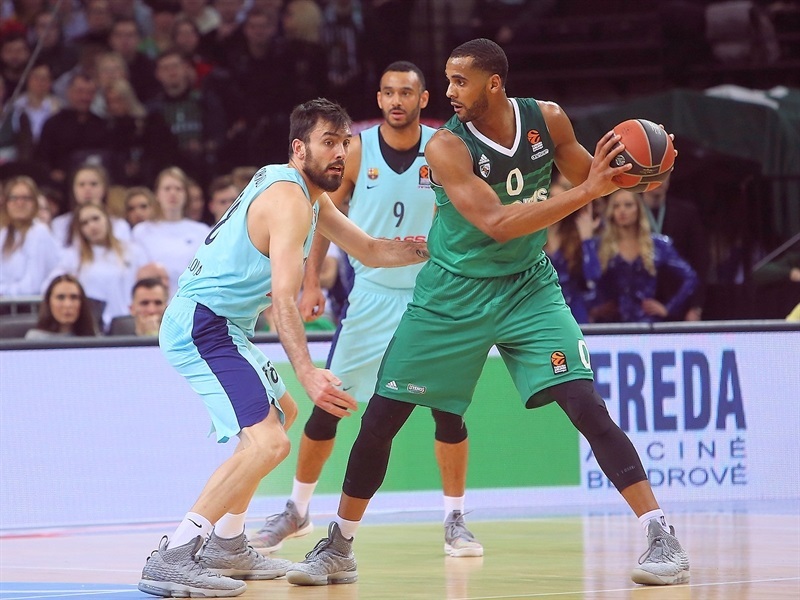 Thomas Heurtel and Juan Carlos Navarro tried to change things for the guests but a three-pointer by Pangos and a dunk in traffic in Davies kept Zalgiris fully in charge, 34-27. 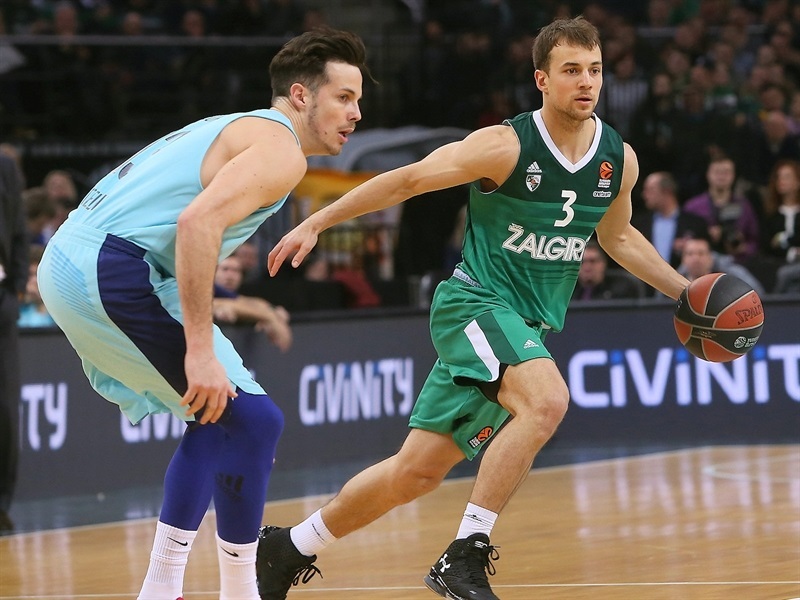 Pangos kept pacing Zalgiris and a layup by Davies made it a double-digit game, 40-29. Oriola and Pau Ribas brought Barcelona a bit closer, 44-34, at halftime. Toupane took over with a three-pointer and a fastbreak layup for a 51-36 Zalgiris lead soon after the break. Tomic followed a dunk with a three-point play and Oriola added a corner triple to give Barcelona hope at 53-44. Milaknis answered with a three-point play of his own and White added a triple and a dunk that broke the game open, 61-44. Davis capped a 10-0 run with a dunk, White scored again and Edgaras Ulanovas added a jumper for a 67-48 score. 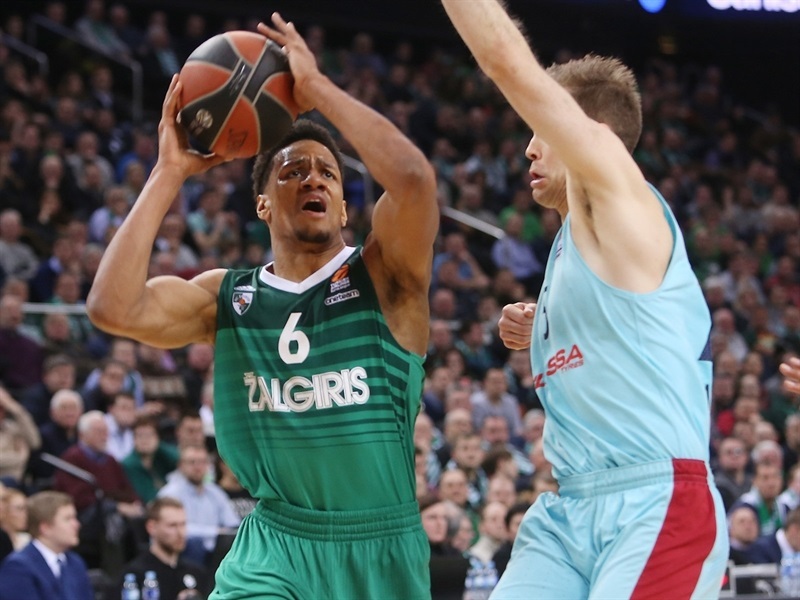 Free throws by Ulanovas and Pangos gave Zalgiris a 20-point lead, 70-50, after 30 minutes. 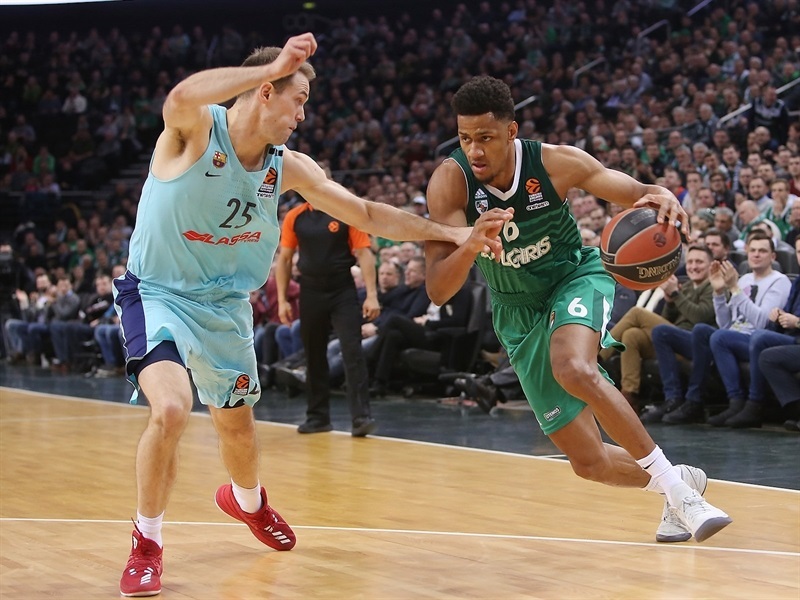 Claver struck from beyond the arc early in the fourth quarter and Oriola added a couple of jumpers but Davies and Pangos kept Zalgiris fully in charge, 75-59. 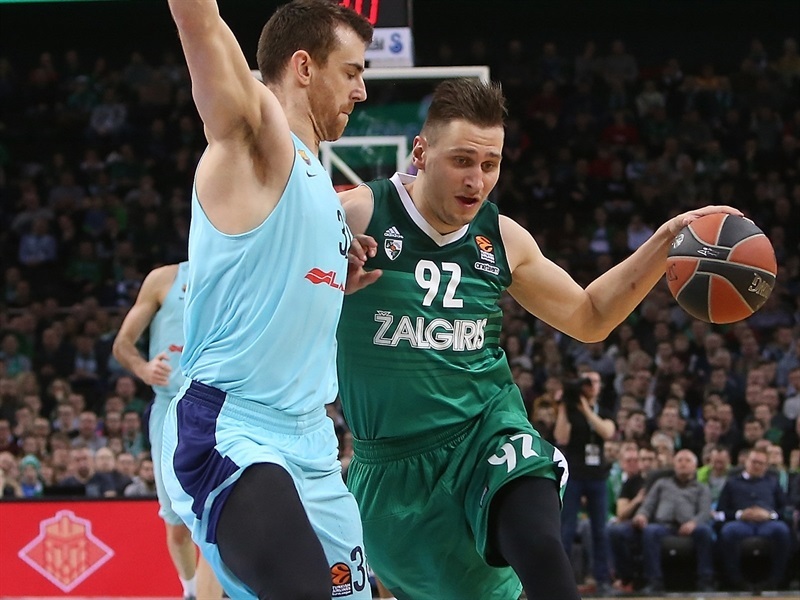 Toupane took over late in the game, allowing Zalgiris to cruise to a well-deserved home win. Both teams return to EuroLeague action next Friday as Barcelona hosts Crvena Zvezda mts Belgrade and Zalgiris welcomes defending champion Fenerbahce Dogus Istanbul. "I think it was one of our best games this season. We were really solid and very intense. Barcelona has been killing teams at rebounds and I think we won the rebounding battle - or at least they didn't dominate like they dominated everybody in the Copa del Rey. It is a great win against a great, great team that will be one of the best teams in Europe in the second part of the season. They were competing – they always compete with the coaching staff that they have. 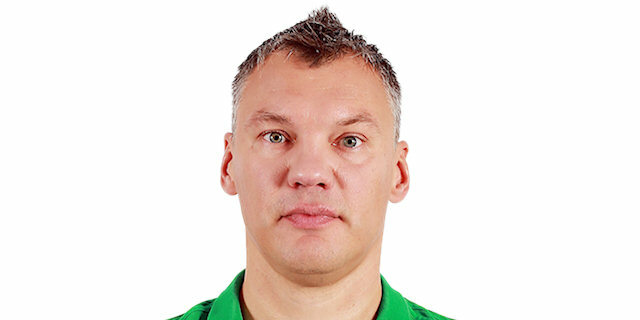 But of course, we didn't expect to win by a big margin and that is just another testament to our players, how really focused they were and it is one of the best games, like I told you. I am always nervous, there are always parts of the game you are not going to play your best and I think we started the third quarter very sluggish. But the good thing is that our bench players immediately came in, gave us that lift and we continued in good shape." "I think we had to bring a lot of energy. We really needed this game badly to be able to make it to the playoffs. We had a great game, followed the game plan and brought energy since the beginning and had a defensive mindset. That was the key. I think I needed a little but of time to get used to the system. Everything was a new – a new city, a new country – so I just needed a little bit of time and now that I have that, it is better and better."